United Hatzalah emergency medics present safety guidelines for the upcoming Sukkot holiday, to prevent injuries during sukkah-building. The season for building Sukkot has just begun and United Hatzalah volunteers have already treated dozens of injuries that occurred while people were building Sukkot. The Spokesperson’s department has therefore issued a series of basic safety tips for the holiday. 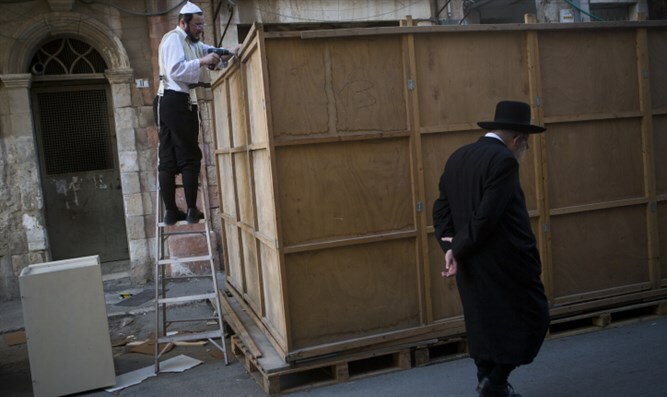 When building a Sukkah one should always be careful when standing or climbing in high places. It is recommended to use proper safety gloves so as to avoid injuries to the hands. Make sure that ladders are stable and being held by a second person. It is strongly recommended to work in pairs if not larger groups so that one person can ground the ladder properly and call emergency services should an accident occur. It is imperative to keep all nails, screws and tools away from the reach of small children. When lighting candles for Shabbat or the holidays, be sure to keep them in a safe location, not near flammable materials, out of the wind, and also out of the reach of small children. Keep the candles on a special platform that won’t burn such as a metal or glass tray and keep them away from the walls of the Sukkah or any flammable decorations.